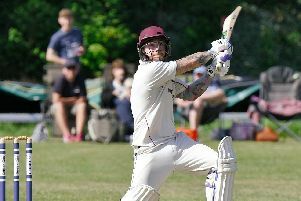 Charlie Pennicott kept his nerve with an unbeaten 77 as the home side chased down a target of 201. The win lifted Borough off the foot of the table and out of the relegation zone with just one game remaining. ‘We were dead and buried at one stage,’ said vice-captain Lee Harrop. ‘We didn’t bowl particularly well but backed ourselves to chase down a target of 201. ‘The wicket was good to bat on but we didn’t start particularly well and lost early wickets. ‘Because our batting has been unpredictable all summer we had rearranged the batting order. ‘That meant we had some experience in the middle order with the likes of Charlie, Craig Stares and Greg Kitchin. ‘But at 78 for six we looked out of it. Then Charlie came in and batted the best I have ever seen him. ‘When our eighth wicket went down we still needed 70. 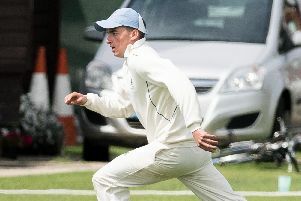 ‘Charlie not only scored runs but also marshalled the two young twins Ollie and Charlie Creal batting at the death. ‘The odds were still against us when the ninth wicket went down and we were still 30 runs short. ‘From that point there was a complete hush around the ground. But when Charlie hit a big six over cover in the 46th over, that was the moment we thought we might win it. ‘The nerves got to Lymington in the final over with a misfield giving us four. Borough now have to be prepared to do it all again in their final game of the season at Hambledon. With three teams still battling against the drop, Harrop knows Borough are still not safe. ‘All the teams involved have tricky final games,’ he added.